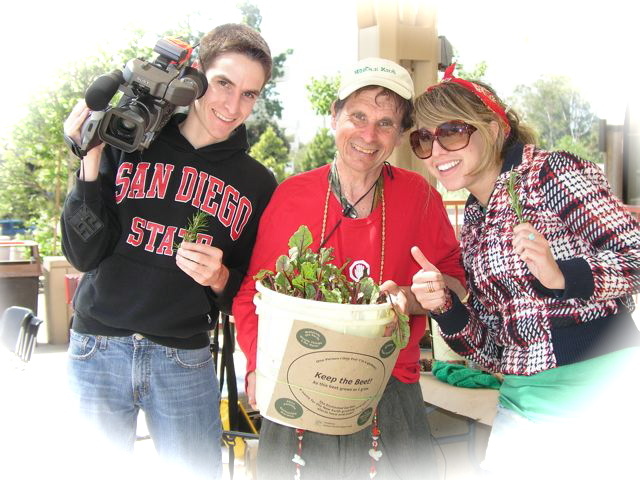 Home » Join the Beet Keepers–Grow A Healthier Pizza 2013! Join the Beet Keepers–Grow A Healthier Pizza 2013! WHAT IS A “BEET” KEEPER? We have lost our beat with nature. “Beet” Keepers, Return! is a play on words for getting your beat back with nature through growing some of your own food. 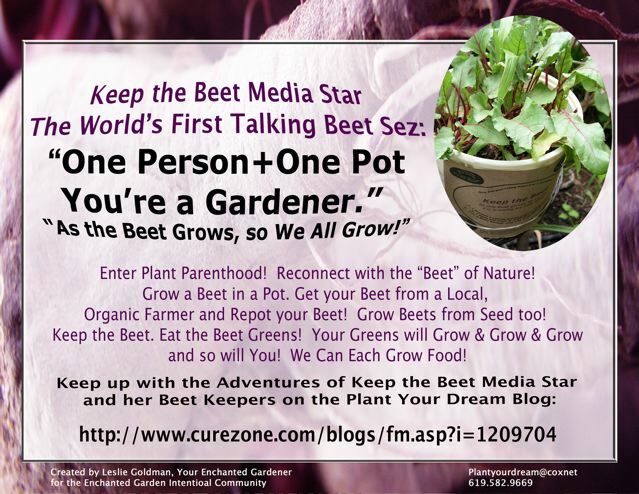 Our projects began with asking each of you to grow a beet in a pot. Each year we ask our Members to expand their Garden of Consciousness through entering Plant Parenthood with more and more of our favorite plants. The current campaign 2013- Is Grow A Healthier Pizza. Begin by getting A Grow A Healthier Pizza Starter Kit for you and your friends. For $10.00 (+ $5.00 shipping, you will receive a Commemorative Packet of KAMUT ® Brand Khorasan Ancient Wheat Seeds and some Baker Creek Non GMO Heirloom Seeds. projects at home with Creating an Enchanted Garden Baker Creek Outpost, and funding the Spring, Grow A Healthier Pizza Campaign. Spring funding will include the Caravan, September 1-10, 2013 to the Third Annual National Heirloom Expo in Santa Rosa, California, September 10-11-12, 2013. I am asking $5.00 a mile as a sponsorship for each of the 1200 miles I will travel. The Caravan began with trips to Mexico in May where I secure support from Indigenous Traditional Medicine Healers, and the Good Will of the Children. ‘Beet Keepers, Return!’ is an international movement to help more and more people regain their confidence that they can grow some of their own food. In doing so, we regain our beat with nature. The Plant Your Dream Blogs provide extensive inspiration for Teachings you will need about bringing in The Enchanted Garden, a name for this millennium that can be 1000 years of Peace. 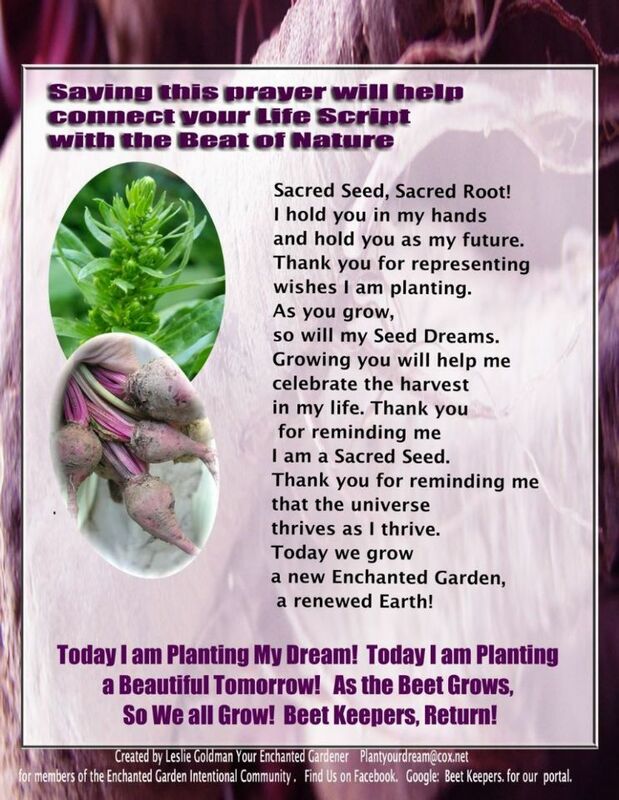 You are welcome to witness to my personal journey of Winning Back by own Sacred Seed on the Curezone Plant Your Dream Blog that has more than 6.5 Million Page Views. The New Plant Your Dream Blog plants Seeds of Success for Super Ripe People and Their Dreams. My name is Leslie Goldman. My role in life is to be Your Enchanted Gardener. My passion is writing daily on the Plant Your Dream Blogs. I have the Curezone Plant Your Dream Blog, and I write as well on this site, The New Plant Your Dream Blog. Curezone.com is one of the most popular alternative sites for information on health in the world. The theme of Curezone.com is Educating rather than medicating. Curezone.com has more than 1000 blogs and more than 7000 average page views per hour. The Curezone Plant Your Dream Blog began in February 2005. I have been the #1 blogger there for many years since then. My cumulative page views on Curezone is more than 4.2 million as of February 2012. The Original Plant Your Dream Blog on Curezone is my daily palette for creation. It is a documentation of my journey. Years ago, I found myself guiding a closing ceremony at the end of an international conference. No one knew me when I arrived at this well planned event. Showing up at places and being an instrument of the spirit of the moment is not uncommon in my life. I do not always know what I am doing, or where I am going, and I feel I done spent eons, many centuries preparing for the work I do now. At that event, I had a table at the end. I was showing my book, Rekindling of Faith. A man came up to me and asked “How did you get enlightened?” Enlightened? The thought had not crossed my mind, although on a daily basis I seek to make wise decisions. I do my best to live the life my soul has proclaimed. On Curezone, I aim to leave a trail behind me. Often I succeed I succeed at what I do. Frequently, I turn within for support, and yet I am in great need of help from others and from the best remedies for living that are possible. On the new Plant Your Dream Blog, I call these remedies Quintessential Solutions for the Compelling Health Issues Facing Us, and I also feature them at our home The Enchanted Garden Intentional Community in an emerging Enchanted Garden Pantry, the foods I use and recommend. a History of the Earth, and its human flowering. and you and I, its Gardeners. I live my life believing that my life is a History of Peace on Earth. 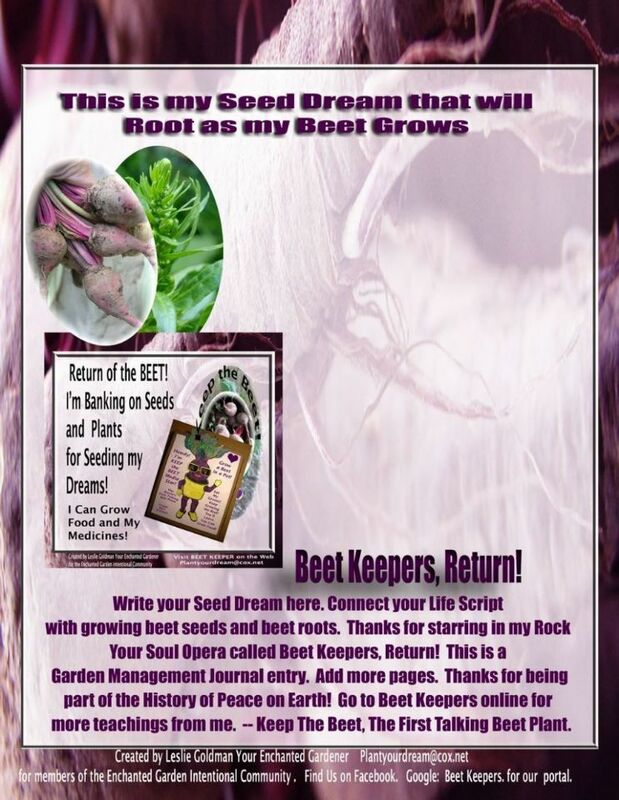 I believe all of our lives are a History of Peace on Earth, and that is why I encourage you to Plant Your Dream and be the Beet Keeper nature intended. I have been, and I have had my life carried along and carried forward my Angels, Angels in human form who sometimes see me, when I am blind, or lost in my lack of vision. You will find my journey meticulously recorded, for all you want to see on the Curezone Plant Your Dream Blog. The new Plant Your Dream Blog here is gratefully sponsored by those who sense value in my I am doing and who have uplifted me. I see the new Plant Your Dream Blog helping birth some of the most important dreams we can imagine as a group culture, and here as well I plant and seed the success of Super Ripe People and their dreams. You are welcome to join me here in this journey. I am convinced that what I hold in my heart and close to my heart will succeed further. This my friend, is the journey of love. Dear friend, we are here in this world to make what was thought impossible, visible. The Curezone Plant Your Dream Blog, when I hit the nerve cord of what needs to be said, has had from 3000 to 8000 page views for all my blog posts in a single day, and averages about 2000 day as of July 2011. My purpose in life is share important information and teachings, and be true to my purpose as an Enchanted Gardener. In recent years, I have been preoccupied with Real Food Safety, Our current Food Emergency, and strategies for taking back our Seed supply. Issues of Urban Agriculture, and the pressing needs of living with others at home always propel my words. Often is it crisis that draws me, more more than often, preparing for moments ahead. The Shift–bringing in 1000 years of peace; and preparing for events keep me focused. Many of my projects I do are non profit in nature, taking on various causes that need attention, and products that I feel deserve my attention because they are tied in with significant evolutionary shifts. When I am feeling fully alive, I live in a world of inspiration. My joy and job is taking on causes that to some seem impossible and making them possible. My joy is to walk through my dreams and to experience the fulfillment of other people’s success. I love to love. I generally take on more than I can humanly do, and I am grateful that in spite of this character trait, I have experienced great fulfillment in my life. I have seen many Seed Dreams fulfilled. I have worked on many Seed Dreams during my life, and seen epic shifts and movements come into reality that were a part of the stream of thoughts I and others carry for doing good in the world. I am a very young 64 years old now, although at times I have been crippled in my body and emotions. Dr. Bernard Jensen, an Elder in the Natural Healing Arts, is my spiritual father, and set my foundation in the Natural Healing Arts. He lived between 1907-2001 and was 92 years old at his passing. Esoterically, I am an Essene Minister, but generally avoid the Reverend title. I was one of the last Essene ministers ordained by Edmond Bordeaux Szekely, who passed in 1979. He and Dr. Bernard Jensen, stand behind me often. The voice of the simple beet, and other plants guide me. I feel that our earth and my life personally are in a cycle of Job’s Return now as we enter 2012. Job was a prophet who lost everything worth having. He help on to his Faith. My life is based on the archetype of Job the Prophet. I believe our world entering 2012 is also in a cycle of Return. Our world has shifted, and it is for each of us to return to Being an Organic Uprising, each of us Standing Up for Nature’s Original Technology. WE WILL GET IT BACK AS BEET KEEPERS, RETURN! I sense we have lost the our Beat with Nature. We are beating to another rhythm and we are racing to the beat of another speed that gets us all in an intense learning curve. I hope my projects find a place in your heart and in your life. I write daily on the Plant Your Dream Blogs, and I welcome you here, to join me in this marvelous quest, the bringing in of 1000 Years of Peace, that has already started, as you Plant Your Dream. and other sponsors that want to help these projects. 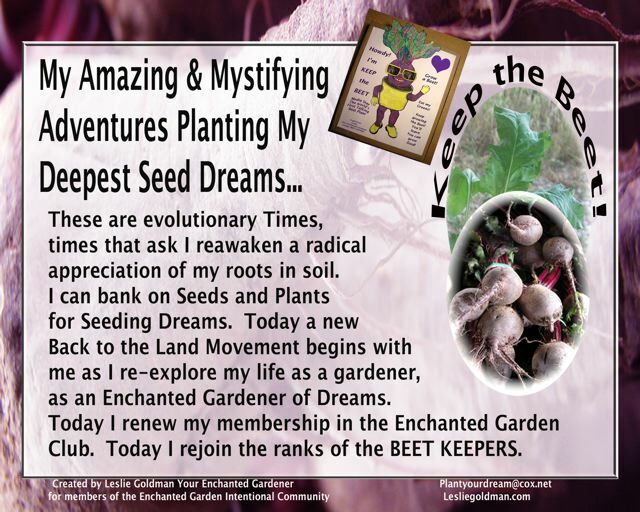 To read more about Leslie and the Beet Keepers, Please go here. Leslie Goldman, sees and seeds success for super ripe people and their dreams. on the Plant Your Dream Blogs. please call Leslie Goldman Your Enchanted Gardener at 619-384.2631.
the simple genuine self against the whole world. towards a new youth. It is the myth of America. I am here to serve, and serve my purpose. Call me, 619-384.2631. If I can help you Plant Your Dream. Please look over various documents below. You will find various documents that are basic to my work on this particular blog below. I return often to these documents. 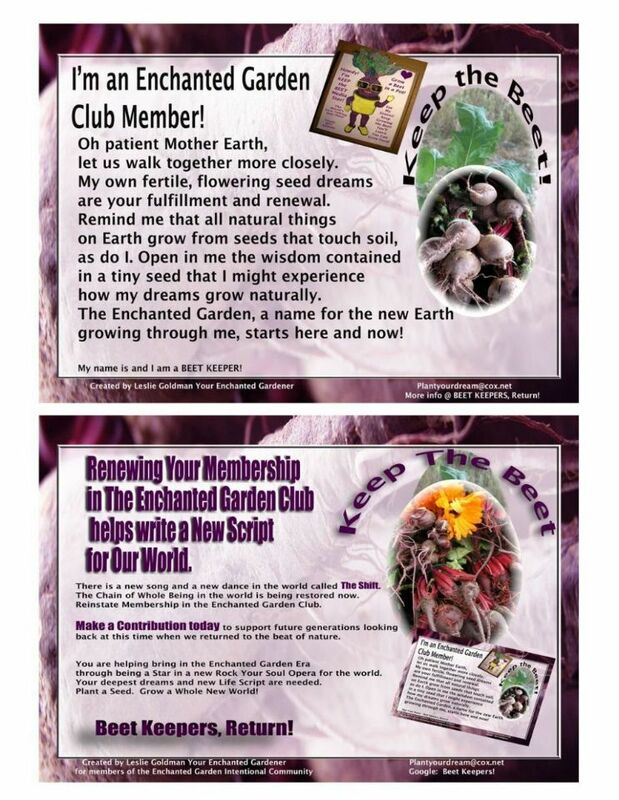 I want to welcome you to explore what you read below, and consider joining me as a Sponsor of the Plant Your Dream Blog, or a member of what I call the Enchanted Garden Club. Grounding further at home, here where I live. Keeping Roundup Herbicide from the Arosa Canyon Rim, the stretches to the West of our 1/3 acre that I call the Enchanted Garden Intentional Community Growing Grounds. To find our way here as a model for local Urban Agriculture for our local neighborhood. to foster intentional living without making this a full time job. To work with sponsors, to fulfill the Plant Your Dream Blog, as a viable and valuable place to inspires deep dreams and see their fulfillment. Beginning to inspire 1,000,000 more youth to regain their confidence that we can grow some of our own food. I really enjoyed your presentation yesterday. It uplifted my spirits and made me feel like I had to do something to make our planet better. Personally, I don’t eat vegetables but everything you said changed my mind about it. I do need to change my eating habits and I do need to grow my own vegetables. You kept the classes’ attention. You were funny, and you kept us interested. You’ll probable be the man that’ll actually get our generation to do their part in helping rebuild our enchanted garden. To hold a vision this land will be secured for future generations as a Park and that the work I do will be archived. One Million to Secure Our Organic Future at the Bayberry Hill Farm, Madison, CT.
$250,000 or more for Dr. Patch Adams M.D. and his Dream Hospital. Farmageddon: The Unseen War on American Family Farmers, would Screen at the White House Petition. This vision came close in Fall 2011 when the film was shown before congress. Related Plant Your Dream Blog, Mr. President, Screen Farmageddon at the White House. A New The Sacred Food Project for the people of all Faith, including the Jewish Tradition, my roots in this life. Birth of Organic Uprising…Each of us being an Organic Uprising, each of us Standing up for Nature’s Original Technology. Managing The Overgrowth Cleanup on our property. Could the threat of Roundup Herbicide be kept from our backyard Canyon? Between September 15-25, 2011, I had an East Coast Tour. I felt elevated to accept my voice as a national voice for sustainable agriculture. On this tour I spoke at Organic Listening Day at the USDA headquarters in Washington, and inspired a panel that showed the film Farmageddon: The Unseen War on American Family Farmers by Kristin Canby. This is a good article printed in Space of Love Magazine about this work. Thank you for being our Enchanted Gardener!”– Mark Lipson, National Organic Program, USDA Washington D.C.
Leslie Goldman, AKA Your Enchanted Gardener, sets out in the 2011-2011 Enchanted Garden Club Beet Keeper, Return Campaign to inspire more than 1,000,000 youth to regain their confidence that we can all grow a bit of our own food. Called “Our Enchanted Gardener” by Mark Lipson of the USDA Organic Sector, you can help move along our first project of our year, the Arosa Canyon Overgrowth Cleanup. at this link Join the Beet Keepers Add your name to the Organic Uprising Artwork that will be giving to the Pacific College of Oriental Medicine. Funds contributed now will help us hire additional help to manage our Overgrowth Cleanup naturally, work with local neighbors, and work in coordination with the FIre Prevention Department. Improved Brush Management Practices here can influence the use of Roundup herbicide everywhere. Thank you to adding your name to our honor roll. These includes helping to Plant Dreams for the Success of Super RIpe People and Their Dreams. I believe I am participating in a History of Peace on Earth through these activities. 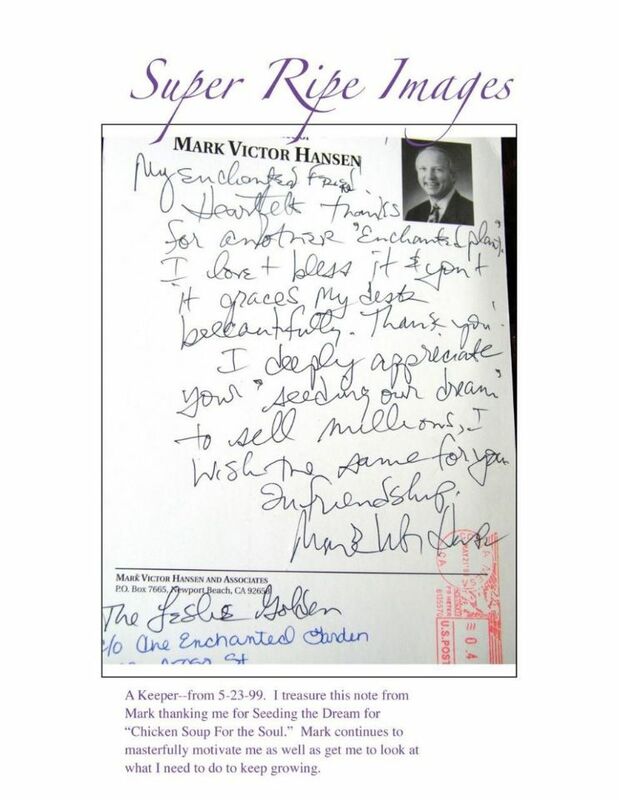 I helped plant the dream for the Success of the series of books called Chicken Soup for the Soul. 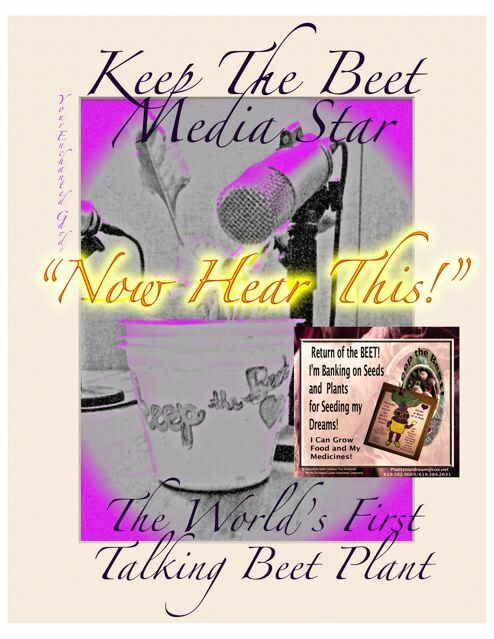 One of our main focuses between 2009-2011 has been to consistently introduce the magical character Keep The Beet Media Star, the World’s FIrst Talking Beet Plant. This is a magical character heading for Hollywood. 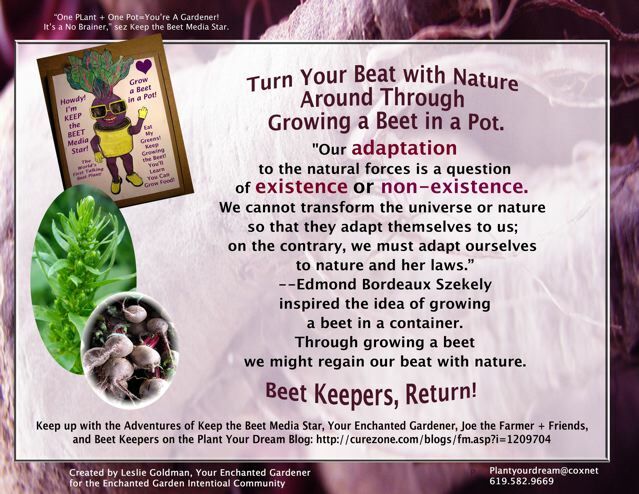 through growing an organic beet in a pot. 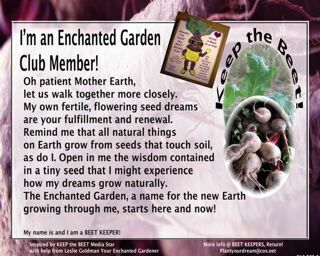 The original Keep The Beet graphic was made by shamanic artist Liora Leah of Mother Earth Heals and various other Curezone Blogs. 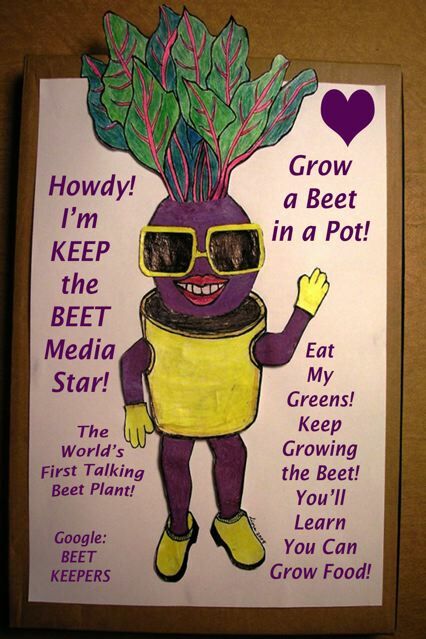 Keep The Beet Media Star issues intentions and proclamations from time to time on the Plant Your Dream Blogs. She is also on Facebook as Keep Beet. If you can hear the “beet,” you are welcome to join her very select group of Friends. More on PACIFIC SYMPOSIUM, Beet Keepers, Return!